If you look at avalanche advisories other English-speaking countries like Canada and New Zealand, they will look similar to our advisory. Thanks to a grant obtained by the Utah Avalanche Center, several of the avalanche centers including those in Wyoming, Idaho, Utah, Colorado, and here in California/Nevada have come together to create this common look. The avalanche advisory is designed for people who have taken at least an avalanche awareness class or preferably an avalanche Level 1 course. We don't expect a first time user to understand the contents of an advisory. This page explains the basic concepts of the advisory and how to read it. This view provides the same "bottom line" summary paragraph as the mountain/basic view. The danger rose graphic next to the bottom line displays the danger rating by aspect and elevation. 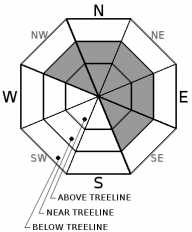 Imagine looking straight down on a mountain from above where the center of the diagram is the top of the mountain and the outside edges of the diagram are the lowest elevation terrain. The shape of the diagram is supposed to remind you that mountains have many ridges, gullies and bowls. For instance, even on the south side of a mountain, the sides of gullies or ridges may face east or west and there may be parts of a bowl that actually face north. Aspect is aspect no matter where you find it. Below this Bottom Line section you will find a brief Weather section followed by a summary of the recent snow and avalanche observations. In the Recent Observations section we have included an image slider that displays the videos, photos, and snowpits collected in the last 5 days. Likelihood of Triggering means the probability that a single person will trigger that type of avalanche in the terrain specified. The bottom position means it's unlikely to trigger an avalanche, the middle position means that it is possible and the top position means it's likely. Size means the size of the avalanche. The bottom position means generally small avalanches that are fairly "manageable". The middle position means medium-sized avalanches that could easily bury a person. The top position means large, probably un-survivable avalanches. Trend means the expected future trend of the avalanche danger, getting safer, staying the same or getting more dangerous. When the arrow slants up the danger is increasing. When it slants down, the danger is decreasing. When it is horizontal, the danger is staying the same.